Having different software to run your business operations can be expensive and cumbersome. Additionally, there is lack of data synchronization leading to inaccurate results. Business insights are important as they help in Business decision making. For instance, generating analyzed financial reports, sales reports, customer reports etc. can show how the company is performing and which area needs improvement to increase profitability. • Different departments within an organization are able to share data easier and faster. Data can easily be accessed from one centralized location minimizing data duplication. 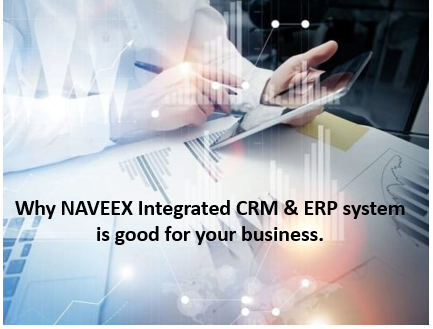 • Naveex CRM/ERP integration provides an improved quote management, accurate data collection and increased data visibility which enhances functionality. Having a clear customers view can help companies make forecasts about future events and solve business related problems. Naveex CRM/ERP solution provides a holistic approach to customer management, where brands have deeper insights into prospects’ behavior, such as purchase history, and contact details. This information is easily analyzed and displayed on a single dashboard, allowing companies to view their customer data quickly, with minimum fuss. Adopting a new system can be time consuming especially if it requires a lot of training in which many employees are skeptical to embrace. You can imagine how hectic it can be if a company have different independent ERP and CRM software and the staff are required to learn how to use at the same time. This can be very expensive and time consuming. However, the integration of both have made it easier for employees to learn and easily apply the same in their daily business operations. It is also very economical for companies as it is cheaper to train staff on one software rather than two. An integration of ERP & CRM provide businesses with accurate metrics. Data can easily be monitored throughout the entire customer lifecycle, hence accessing the latest Business Intelligence (BI) in one location. The BI help companies to visualize data for a 360-degree view of all relevant metrics – across sales, marketing, customer service, operations, finance, IT and HR. Companies are in a position to discover more about their clients and customers and use these analytics in decision making processes and making future business plans for company’s growth. ← How close are you to your business?